Not only are they amazing to look at, these bamboo socks are superbly snug and creatively comfortable, while still allowing the feet to breathe easier than they would through old fashioned cotton socks. GetSocked aims to spread a bit of joy, mystery and excitement by delivering a unique pair of socks, direct to your letterbox each month. 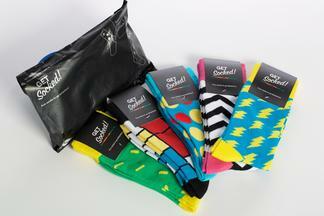 Let your socks do the talking and make colourful socks your own personal trademark. Very handy, socks always seem to go missing in my house and this just lights up my month. Highly do enjoy this time of the month.